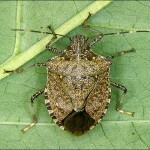 Brown marmorated stink bugs (BMSB) are expected to begin dispersing into fruit orchards any day. Based on previous years observations and a phenology model that is being evaluated, we expect BMSB to make the large first movement into peach between 80-200 DD (base 14°C). Historically, this has been the third to fourth week of May. We are currently at 175 DD in South Jersey and are expected to hit 200 DD on May 21st. North Jersey will be a few days behind. The peak dispersal into peach has been around 200 DD the last two years. The phenology model we are working on has not been evaluated in other fruit crops. Adult BMSB gradually emerge from their overwintering sites and seek food resources. Their protracted emergence from overwintering sites makes refining this phenology model difficult. However, peach is a preferred host plant at this time of the year and damage can occur. Adults dispersing into the orchard are becoming reproductively mature and egg masses can generally be found about 1 week after the large dispersal event. If you have had issues with BMSB in previous years, an insecticide spray to protect the fruit early next week may be needed. See the Rutgers Fruit Production Guide for BMSB insecticide recommendations. Selecting one of the insecticides that have shown good efficacy as an initial treatment (once bugs are seen) such as Endigo or Belay should reduce breeding populations early in the season. Adults will move in and out of peach orchards and eventually into apple throughout the season. Nymphs can complete their development in peach and possibly apple. In New Jersey we have two generations of BMSB although at this time, the second generation appears to be a small subset of the population.